Your leg can’t stop shaking. Your palms are sweaty. Fine sweat beads, like grains of sand, stick to your upper lip. You wipe them away with your sleeve, but they’re back moments later. It’s as though a thousand tiny, leaky spigots are embedded there. Sound like symptoms of heroin withdrawal? I guess so, but I’ve never been addicted to heroin. What kind of person do you think I am? But there is a form of withdrawal which I can relate to – that being from one of the most addictive substances on the planet. Everyone needs it. And everyone wants it, whether they admit it or not. It goes with just about everything: vegetables, fruit, sandwiches, beef, chicken, fish, red wine, white wine, canned wine – breakfast, lunch, and dinner. Why not include candy in that list? 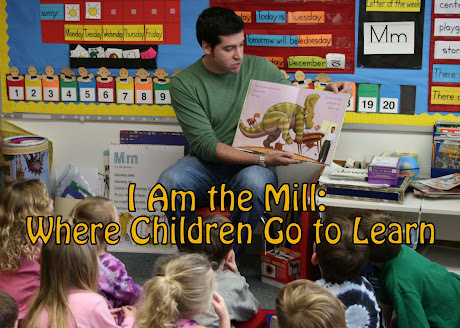 Before, I would have balked at the thought. 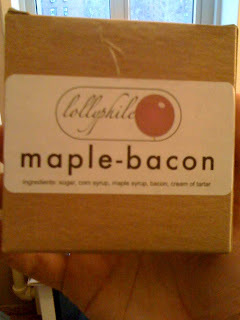 But after actually tasting the Maple-Bacon lollipop from Lollyphile, my life has been changed. So excited I needed to use a high-speed camera in order to eliminate blur created by the shaking of my hand. Real bacon. Real lollipop. Real delicious. Suckable bacon. What could be better? 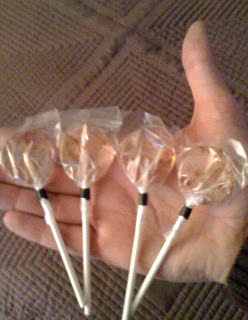 Admittedly, the lollies are a little smaller than I had hoped (bigger lollipops = more bacon). But the quality of the candy, and the real bacon embedded inside, is outstanding. A little smaller than expected. I wanted lollipops the size of a basketball. These aren’t Bac-os, or similar artificially flavored bacon bits. This is fresh cooked bacon, chopped into small pieces, and surrounded with a mildly maple-flavored clear sugar base. Even before unwrapping the pop, the bacon aroma hits you in the face like a stiff breeze. Not at all overpowering, but you know right away that this is no ordinary lollipop. The sweet and salty pairing is nice and balanced. Also, the bacon isn’t greasy at all, and although nutritional information is not available on the packaging, I’d bet that this treat has much less fat and calories than your average piece of chocolate candy, for example. I’m eating one right now, as I write this. And I’m enjoying it. I ate one yesterday as well, and gave on to my roommate. There’s only one left, and I might give that one to my boss. I guess it speaks to the quality of the candy that I feel a slight sense of sadness in the knowledge that my supply of these bacon pops will so soon be exhausted. It’s almost too much to bear. My two complaints – make the pops a little larger., and add more bacon. There’s not quite enough bacon. Too much clear candy. 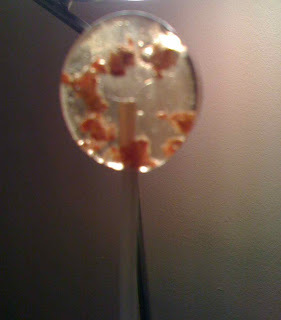 We need to see a few more chunks of the smoky pork stuff floating around in these lollies. The more bacon, the better - not just in lollipops, but in life. But overall, it’s a nice gourmet treat. Unusual in concept, but perfectly enjoyable in practice. I recommend these pops. They’d make a great gift for the bacon lover (pretty much everyone) in your life. As a heroin addict I have to say a big "f you" to comparing some stupid candy you most likely have a hand in selling vs. giving up the habit. Ok, I'll shut up if you do herion 3 times then still think a sane man would compare it to bacon. Bacon doesn't give the intest life ending high that heroin does. Its not even close. You blow for making a joke of the two. Seriously. Stick to: two fat thighs, two skinny breasts, and a lot of left wings. This has to be from The General, Nanni, or Dulak. Dude, I knew you were out there watching, waiting for the perfect time to leave a ridiculous comment. The irony of a heroin addict calling me a loser is brilliant. Thank you. But no, I have absolutely no financial interest in any candy companies right now, much less the one that makes bacon lollipops. If I'm interested, I'll start my own company.